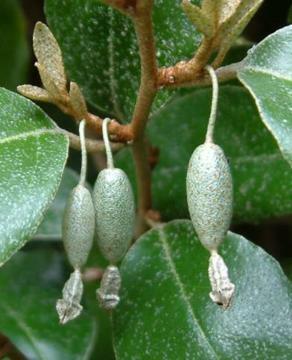 Adaptable, vigorous evergreen with silvery grey-green leaves. Scaly shoots. 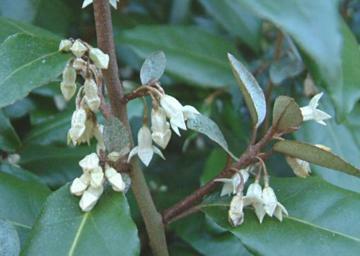 Small, fragrant, creamy white flowers crowd the branches in autumn followed in spring by small ovoid, pale greyish green berries. Will survive successfully in many situations. At its best in well drained, reasonably fertile soil in full sun. Very tough, drought tolerant and wind resistant. Well suited to maritime and exposed locations. Less successful on shallow chalky soils, tending to become chlorotic. May be trimmed to restrict size or create hedges. Shrub borders, screening and hedging. Although it can be successfully trimmed to formal shapes, its rapid grown means that it is best suited to more relaxed styles. The berries are used to make a conserve.